Few books illuminate a domain of clinical inquiry as superbly as Psychoanalytic Perspectives on the Rorschach. 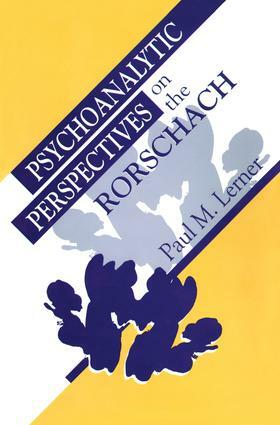 Paul Lerner has written a comprehensive text that offers a richly detailed, multidimensional vision of the Rorschach as the ideal medium for operationalizing, testing, and in some instances transforming contemporary clinical theory. For psychoanalytic therapists, the book provides a fascinating overview of how the coevolution of psychoanalytic theory and Rorschach technique has created new possibilities for conceptual integration. Lerner explores recent advances in our ability to operationalize such clinical concepts as splitting, dissociation, and false-self organization. He then reviews how these advances have been applied to research into psychic organization across different diagnostic categories, including anorexia and bulimia, aggressive and psychopathic personality, and schizotypal disorders. Finally, Lerner shows how the resulting data offer a unique vantage point from which to clarify such critical topics as developmental object relations and the structure of primitive experience. Rorschach scholars will appreciate Lerner's informed discussions of theorists as diverse as Rapaport and Schachtel, Exner and Mayman, Schafer and Leichtman. Rorschach students, for their part, will find the book an unusually lucid introduction to test administration, scoring, interpretation, and report writing. Even here, however, Lerner's breadth and originality are apparent, for his exposition of these testing fundamentals incorporates fresh discussions of the nature of the Rorschach test, the impact of the patient-examiner relationship, and the value of the test in treatment planning. Timely, definitive, and uniquely integrative, Psychoanalytic Perspectives on the Rorschach will be valued by students, clinicians, and researchers well into the next century.